Delhi Academy of Medical Sciences, India’s leading PG Test Prep Institute today leapt into history by launching India’s First Tablet based Digital Learning Tool – iDAMS for Time & Resource starved PG Medical aspirants. iDAMS gives students access to real time high quality video lectures, self-study material, assessment tools in their hands that will help them master key subjects. Apart from the interactivity of a classroom, iDAMS provides access to great teachers, full lectures, engaged learning breaking the barriers of distance, time and techniques. With the iDAMS, a large number of medicos, who otherwise couldn't take the advantage of DAMS quality teaching because of various reasons like non-availability of DAMS centre in the vicinity, affordability of time and money, would be greatly benefited. The content of iDAMS includes 100 plus hours of digital quality, study material and video lectures, designed and developed by a handpicked team of academic experts. It provides, ready access to special MCQ based sessions by subject specialists. A student can avail the advantage of learning from the best team that is known for producing amazing results year after year through a series of interactive tools and a personalized feedback system. With the new Android based Tablet iDAMS, having WiFi connectivity and Bluetooth Technology, the digital lectures and online Tests the students can use the DAMS expertise anyday, anytime, anywhere. The 16GB memory in the tablet shall allow them to keep enormous useful data onto their palmtops always. The students can enjoy the luxuries of their own schedule, time and convenience and can interact with the DAMS Talent & Resource Pool through DAMS EXCLUSIVE CLUB on facebook. Dr.Sumer Sethi, CEO DAMS told our correspondents during the launch of iDAMS that it would be particularly useful for those medical graduates who are in the those remote parts of the country, where training resources for them are hard to be found. Secondly it would supplement the resources of those students who are using other contemporary meansfor prparing for their higher studies. 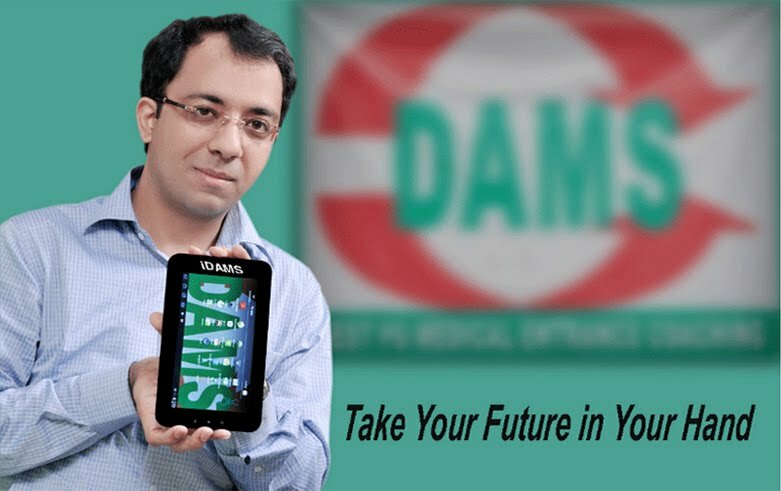 Though DAMS has largest network of classroom & Test centres across India, by making this tablet available, they have proved that if students could not come to DAMS, DAMS would reach them to lead their way to glory. The students now can use iDAMS, enjoy their journey to Success and when they reach their destination… relax, look back and smile!!! !